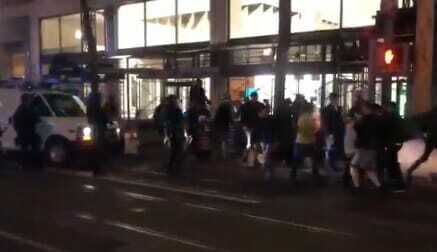 There was a MASSIVE STREET BRAWL in Portland, Oregon Saturday night. Police were called in to break up the fighting that spread from the sidewalk into the street. Right-wingers and Antifa leftists brawled outside of Kelly’s Olympian. This was way worse than New York City fights last night. Proud Boys and Patriot Prayer members and and Antifa had a huge wild fight. The Patriot Prayer Rally schuduled a prayer meeting for Saturday night. Antifa leftists showed up with weapons and started a brawl. This got really ugly, really fast. Hundreds of people were out on the street. Portland Police are standing by. 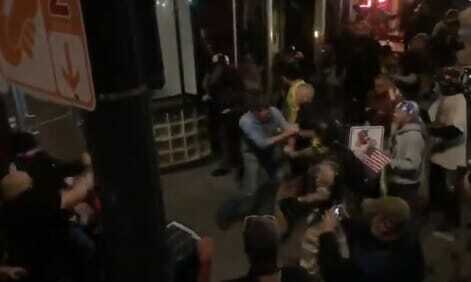 UPDATE: A more complete, news-style roll was posted by Ruptly (brawl starts at :54 mark).